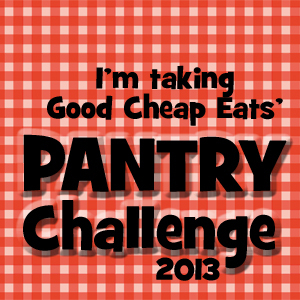 I'm doing the Pantry Challenge with Good Cheap Eats in January. My goal: make one big trip to the grocery store, and other than that, only shop for milk and fresh fruit/veggies. 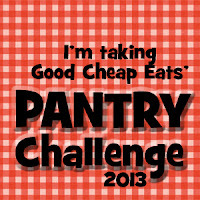 Today I spent a couple of hours going through what I have on hand and browsing recipes to see what all I could put together. From this list, I made out my grocery list for tomorrow, planning to buy as few ingredients as possible for the month. Of course each one needs some sides, but that's the basic list I'll be working from. I'm updating this list through the month, crossing off meals after we have eaten them. My grocery list includes whatever kinds of meats are on sale/clearance, and from there I'll add more meals.